What lurks in the shipwrecks of the briny deep? 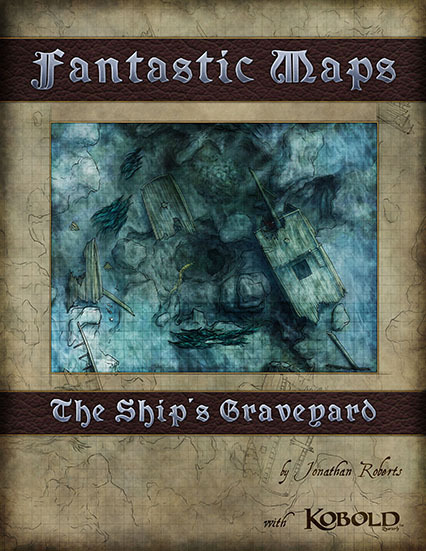 Today sees the release of The Ship’s Graveyard map pack released in partnership with Kobold Quarterly. The pack details a huge underwater map (25 square feet when printed out full size) with walls of kelp, schools of fish and shipwrecked hulks. The perfect lair for a kraken or aboleth and their dark designs upon the world. When I used this map the players found themselves in the deep after their ship was destroyed by a kraken. At 6000px square (25 square feet when printed out at 1 square = 1 inch) there’s more than enough room for an epic battle against the horrors of the abyss. Author JonPosted on May 2, 2011 November 2, 2015 Categories Battlemap, Map, Map PackTags 4e, aboleth, anchor compass, Battlemap, dnd, dragons, dungeons, fantastic maps, fantasy map, kobold quarterly, kraken, pathfinder, shipwreck, sunken empires, underwater, whirlpool1 Comment on What lurks in the shipwrecks of the briny deep?